Race and the Obama presidency: A conversation with Jamelle Bouie and Jelani Cobb. 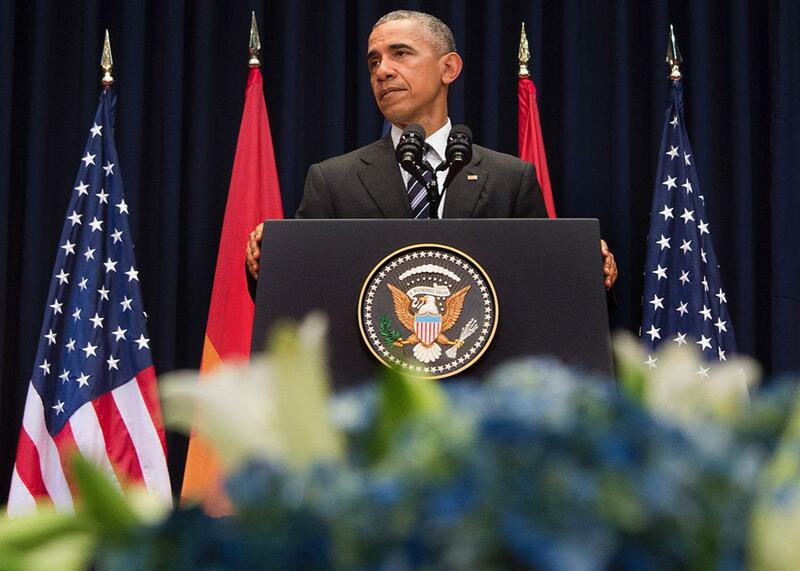 Barack Obama delivers remarks at the National Convention Center in Hanoi on Tuesday. On Sunday, I moderated a discussion featuring my colleague Jamelle Bouie and the New Yorker’s Jelani Cobb at the Oakland Book Festival. The panel, “Race, Politics, and the Obama Presidency,” was initially intended as a look back at how the current president has discussed race during his two terms in office. But given the political earthquake that is Donald Trump—not to mention the still simmering contest between Hillary Clinton and Bernie Sanders—we ended up talking primarily about the ways in which race has shaped this year’s contest for the White House. A condensed and edited transcript of the conversation is below. Isaac Chotiner: How has the presence of a black president for the past eight years played a role in Trump’s rise? Jamelle Bouie: My theory of the case here is I think that Obama, as a person, represents for a nontrivial number of white Americans a sense of diversion from the political order, as they commonly understood it. And I almost have a bit of empathy for that perspective. One day the president of the United States is George W. Bush, most of the country’s political leadership looks like you, has similar cultural experiences as you, and then, all of a sudden, it’s completely different, and it’s completely different in what feels like a radical way. And it feels like a radical way, in part, because of all the rhetoric around Obama, both from the right—that he is a socialist, that he is someone who is undermining our [right to our] guns—but also from the left—from this idea that this now demonstrates that we don’t need a traditional voting base to win national elections; that we can win on the strength of minorities, and young women, and just a smattering of white voters. And if you look at the social science, what you find—in concrete terms—is an increase in the amount of what political scientists call “racial resentment” towards Obama. So: Donald Trump, in some way, is almost spontaneously generated out of all this anxiety and fear and sense of dislocation among some number of white voters. He kind of captures their feelings; he captures their sense of loss that they’re no longer at the top of a status hierarchy that they just assumed had always existed. And I’m not sure if people are understanding this in conscious ways—I think it’s a very visceral and very emotional thing. And it’s almost funny that Trump himself is so visceral and so emotional in his person—he embodies this fear and anxiety. I think that’s what’s underlying his campaign, and, in that sense, it’s almost inevitable, right? In American history, major gains that are substantive or symbolic among African Americans, in particular, and minorities, broadly, always have backlashes, and always have reactions. And oftentimes those reactions take an almost perverted form of the original gain. Jelani Cobb: Yeah, Jamelle and I had companion pieces that came out about a week or so apart talking about the Trump phenomenon and the way it related to populism. Jamelle’s absolutely right about this backlash, and if we were not aware of this—if we had managed to sleepwalk through all the other things, through the president being racially profiled, in the sense that he had to actually show his birth certificate to prove that he was eligible to vote in the election he actually won, being called a liar in the midst of his State of the Union—if we kind of skipped past all that, the place where it, for me, became difficult to see this as anything other than the long tradition of white redemption was the Charleston shooting last summer, where you had someone explicitly using language that said that black people were taking over, that the country was being taken away from white people, and that he had made this symbolic act of violence in order to reverse that tide. It’s not coincidental that South Carolina has this interesting relationship to these things, which is that it was the only one of the 13 colonies with a majority-black population and, with it, a form of racial paranoia, which comes when you know that people you are oppressing and exploiting outnumber you numerically. There’s a book by an historian by the name of John Cell—The Highest Stage of White Supremacy. He talked about democracies—societies that functioned democratically for most of the population or for some of the population, but there’s another part of the population that’s completely excluded. And what Cell said is that in most circumstances, the societies in which the empowered group is larger than the disempowered group tend to be slightly more liberal than societies in which the empowered group is a minority and the disempowered group is a majority, for reasons that are not hard to figure out. And so, the conversation that we’ve had about Obama and around Obama was that there was this new coalition that was emerging—that people of color would be a majority at some point and that this would augur a particular kind of political change. And just to show the kind of bizarre, almost hallucinatory ways in which white people reacted to this, when you poll white people, there are pluralities, and in some instances majorities, that will tell you that the main group that is racially oppressed in the United States is white people. And the first time I saw this, I thought it was some bizarre outlier. It’s striking, though. It’s striking that history recalls itself. Around World War I, the external threat was thought to be Bolshevism—the potential Communist fear—and people associated it with this one ethnic group, which was Jews. They said we needed to surveil them, they said we needed to prevent more of them from coming into the country, which they then did with the 1924 Immigration Restriction Act, and that they needed to deport people who were disloyal from the country. Move forward a century, and that is exactly the rhetoric we are hearing used around Muslims, with no sort of cognizance that this is a replay of history, that this falls into a particular nativist, xenophobic tradition that was spawned by the same reasons, the same sort of demographic change. And Trump is at the head of it. Chotiner: There’s been a debate about the rise of Trump, and a lot of people have been arguing that racism is responsible for his rise, and there’s another faction of people who’ve been saying that “No, it’s not; it’s about economic dislocation, it’s about trade hollowing out areas of the country.” What do you think the differences between those two arguments say about our current political moment? Bouie: For me, at least, I think [the economic arguments] demonstrate a tremendous level of not taking racism as a social and material force seriously enough. My usual response to the argument that this is economic dislocation is to note that the American working class is, at this point in time, about 40 percent nonwhite—African Americans, Latinos, Asian Americans between 18 and 64 account for about 40 percent of the Americans who identify themselves as working class. These are people who have seen the same kind of economic dislocation as their white peers. They are struggling just as much, and yet they do not see any particular appeal around Donald Trump, which, to me, is sort of like God, in his infinite wisdom, has given us a control group for a social phenomenon that we can observe right there. We have two groups of people who have, really, not-that-similar economic situations, typically—poverty and economic dislocation among people of color is quite a bit worse. But, for the sake of the experiment, you have two groups facing similar kinds of economic situations. We have one dude who is supposed to represent people in an economic situation, and one group of people backed him, and one group of people did not, and the operative difference is that one group is white, and one group is not. Which makes me think that what’s going on here is tied deeply to race. And I think the left’s argument that this is primarily economic is a bit dangerous, because what it suggests is that if we talk about racism maybe it alienates these folks, so we should submerge it and not address it directly. People trying to organize working people have tried that approach before, and it’s been a miserable failure for everyone. Cobb: That is the history of the left’s failures, period. For the 20th century, that is the history of the left’s failures. One thing that’s happened with the Sanders phenomenon and the Trump phenomenon—if I could just make a quick detour into the Bernie Sanders conversation—one of the things that the Sanders campaign did not realize until probably too late was that the Black Lives Matter protesters who were disrupting his rallies were doing him the best favor they could have ever done—doing his campaign one of the best favors they could’ve ever done. Because to the extent that he has not replicated that kind of race-less class analysis in his campaign, it is in direct response to these activists who have been saying race is an actual dynamic; it has actual consequences; it is not just something that is in our past. Chotiner: I want to follow up on something you said about how 40 percent or so of what we consider the working class is not white and they’re not voting for Donald Trump, obviously. The other person, on the whole, they’re not voting for is Bernie Sanders. And I was wondering what you think that says about the allegiance of nonwhite voters to the establishment of the Democratic Party, and also about the Sanders campaign. Cobb: Yeah, I don’t think it’s necessarily allegiance to the establishment part of the Democratic Party—I think it’s more about pragmatism. In 2008, that surge of black voters—in South Carolina, black people were about 50 percent of the electorate—that surge happened after Obama won Iowa. And at that point it became clear to African American voters that this was not just a lark. So people were kind of calibrating, “Oh, OK—Obama’s talking about things that I agree with, he seems like a great candidate, and so on, but he has no chance of winning because white people are not gonna vote for him; therefore, I can’t afford to waste a vote.” So, looking at how that turned around when he won Iowa, all of a sudden people looked at him as a viable candidate. And so people said that African Americans voted for Barack Obama because he’s black. I thought that was the most ridiculous observation. You could actually make a stronger argument that white voters voted for white candidates because they were white than you could black people voted for them because they were black. The overwhelming majority of black candidates for president have not gotten major support from the black electorate. I mean, Al Sharpton lost Washington, D.C.
Chotiner: Herman Cain was never elected. Cobb: Even when Jesse [Jackson] ran in 1984, Coretta Scott King endorsed Walter Mondale. And people thought this was a betrayal, but she was doing this as a pure, pragmatic, political undertaking. So I think that has a lot to do with the way people are reacting to Sanders, although he probably could’ve made a more impressive showing among African Americans had he started earlier—had he been willing to talk about race. Bouie: I do think it probably hurts Sanders that his political base is in Vermont—is in the least diverse place within the Northeast. I guarantee that if Sanders could’ve launched his campaign in Georgia, and did all his early organizing in the South, before trying to go north, he would’ve done much better. Cobb: There’s one other thing to be added about the retail politics part of it. Some of this was self-interested. Certainly, some of it was self-interested in terms of people’s relationship with Hillary Clinton in 2008. As one long-standing congressional representative said to me, “We looked at Hillary Clinton as a chance to cash in. We have done a lot for the Clintons—we have a long relationship—and if she gets into the White House, we can then say, ‘We want this; we want that; we want this.’ ” Another person said that she had gone to Bill Clinton during the ’90s and said that they desperately needed to earmark money to fight HIV specifically in black communities. And they were able to get that. So they were thinking about the transactional part of it. And what Obama did, essentially, was create a parallel structure that ran around the black democratic establishment. And the way that he did it was brilliant, to see it kind of unfold, as I did in South Carolina. But Sanders didn’t do that. Chotiner: One thing you guys did not mention was that Sanders ran against Obama and Obama’s record, to some extent. Bouie: Right. The cliché about how Bill Clinton was the first black president that everyone, I think, gets wrong when they recount it, is that Toni Morrison wasn’t literally saying that Bill Clinton was the first black president. She was saying that the way he was treated was reminiscent of how establishment figures have treated powerful black men. And in that, he was the first black president. A bit of irony that this got lost in translation. But all that kind of adds together to create at least a background radiation of an allegiance. Cobb: One of the footnotes about the way in which black people view Barack Obama: They think of Obama as a metaphor for the way that they get fucked with in their jobs. They see the same sort of parallel between the frustrating waves of racism in their own lives and what Obama has experienced. Chotiner: How do you think Obama’s rhetoric on race and racial issues has changed or evolved over the last eight years, and what you think it says about him and his presidency? Cobb: I remember my father telling me about growing up in segregated Georgia—a very good education—to never underestimate the distance that white people will go to break down a black person they found to be a threat. This is something he found important for me to know, as a young person. I don’t think Barack Obama knew that, quite honestly, and when he saw the intransigence again and again [when] trying to do transactional politics with Republicans, he found himself stymied. He tried that with health care, he tried that on the environment—and he got slapped in the face each time because this was not the transactional politics of old. This was not people who operated on kind of a meta level—saying one thing in public and doing something else behind closed doors, and that kind of horse-trading. This was about racial resentment.